Most Muslims have been taught that they have "the original Quran" locked up somewhere, and so they constantly criticize the New Testament and question its authorship. But as they do so, they fail to consider how they themselves received their Quran and their Hadith. The Quran represents the Islamic scriptures, while the Hadith are the traditions from which Muslims learn about the life and teachings of Muhammad. The Hadiths also teach Muslims how to interpret the Quran, making the two texts completely dependent on one another. But how were the words of the New Testament handed down to us, as opposed to how the Quran and Hadith were handed down to Muslims? The Gospels are 1st century Greco-Roman-style biographies which contain both the life and the teachings of the One and Only Son of God, Jesus Christ. All of the data contained in the New Testament Gospels was delivered to us either by eyewitnesses or by direct disciples of eyewitnesses. All four of our Gospel writers were fully able to interact with other eyewitnesses to confirm the facts at hand before setting them down in writing. But not so with the Quran and the Hadith. As we are about to see, Muhammad himself was never an eyewitness to any conversations between his source and the Muslim god, Allah. Although he claimed that the Quran contains Allah's literal words, he relied completely on what was related to him by a being who he at first thought to be a demon, but later called an angel. The Hadith, on the other hand, took an even more circuitous route. The Hadith have two parts: the actual text of the hadith and the chain of narrators, called the isnad chain. The isnad chain is comprised of the names of the men who carried the information forward -- from memory -- from its original source, one of Muhammad's Companions. with how the god of the Quran brought his message to Muslims. As we can see, with the Christian Gospels, the farthest information has to travel from the direct eyewitness of events to the written record is 2 levels. With Muhammad's Quran, information is said to have traveled from Allah to the angel to Muhammad, then to the memorizers before it finally makes it to the written record, the Mushaf (or the written pages of the Quran), for a total of 4 levels. This shows us that corruption of the text could have occurred in the transmission from Jibril to Muhammad, then from Muhammad to the Qurra, and from the Qurra to the written text. But, as we have already noted, there is one more very serious problem with the mode of transmission of the Quran, and that is that Muhammad never heard from Allah directly. Muhammad was never an actual eyewitness to the "revelations" given to him which were supposedly from Allah. Not only could he never confirm that what the angel told him came from Allah because he was never there to hear the actual words, but no one ever confirmed that Muhammad had, in fact, spoken to an angel. There was no witness that Allah spoke the words of the Quran to the angel. There was no witness that the angel ever spoke them to Muhammad. We have only one man's word, Muhammad's, for all of the content of the Quran. And all of this comes to us not just secondhand or thirdhand, but fourth-hand. the average Hadith first passes through as many as 6-7 levels (the average length of an isnad chain) before it gets to the reader. 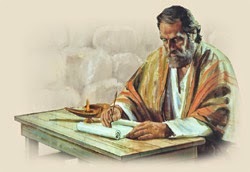 The entire New Testament was a completed text before 100AD. 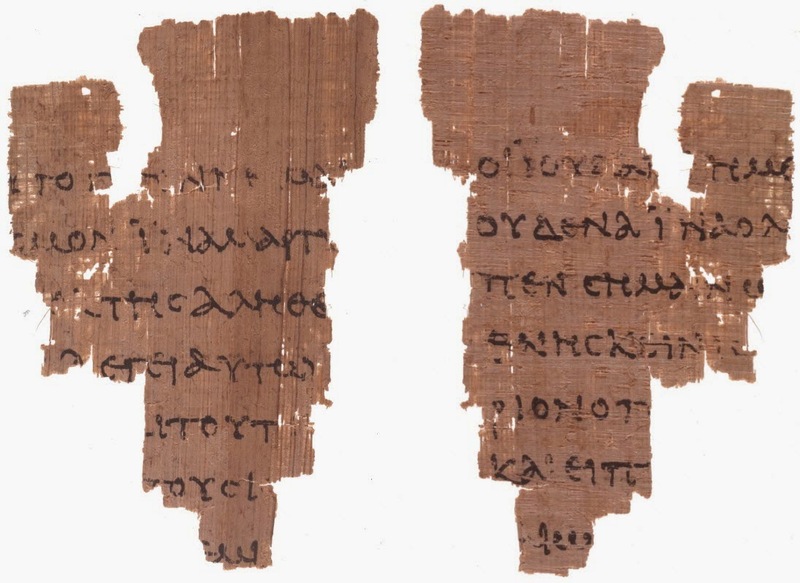 The Scripture portion pictured above dates from approximately 65 years after Jesus' return to heaven, while a recent discovery has been tentatively placed at 75AD, or just 40 years after Jesus. 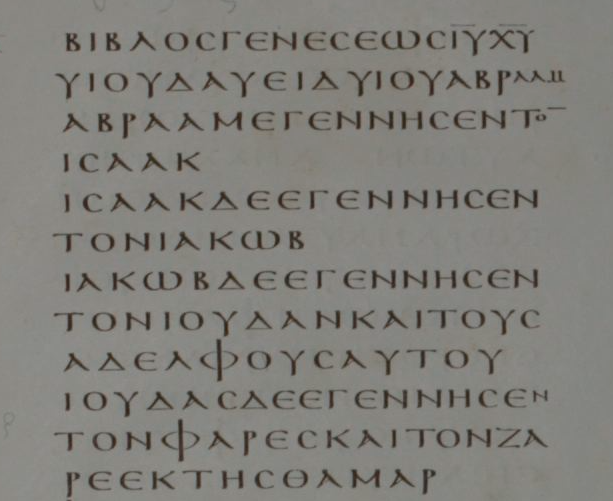 P52 (above) reads exactly the same way as most modern Bibles. New Testament and Greek scholar Dr. Daniel Wallace believes that the Gospel of John, traditionally thought to have been written last, could be dated to as early as 60AD, reducing the above figure to just 30 years from the ascension of Christ. 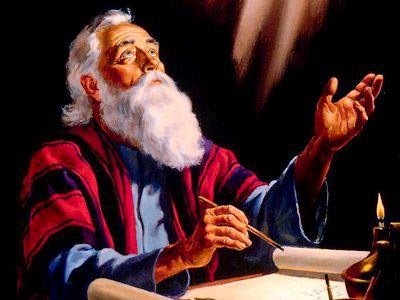 Note as well that the New Testament texts are more than 500 years older than Muhammad and Islam, and would therefore have been subject to much greater deterioration than any Islamic texts. 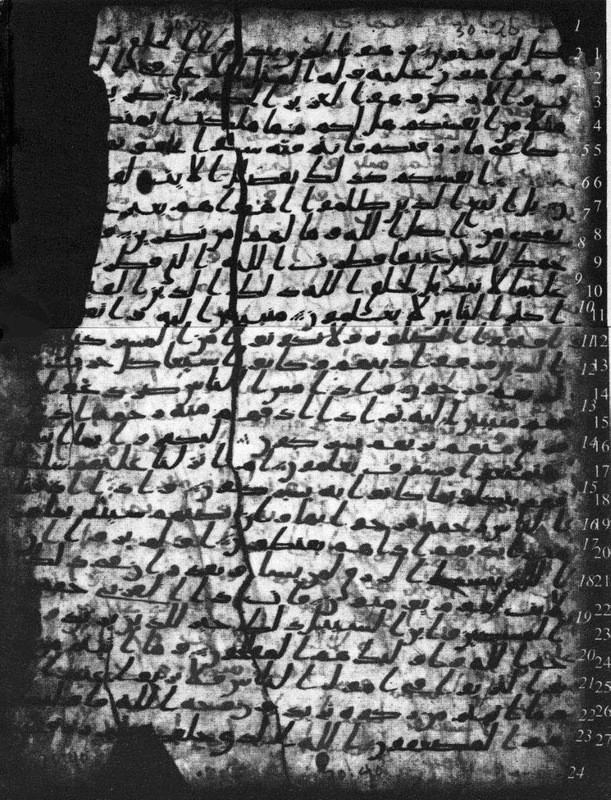 The Quran palimpsest above is from the oldest Quran available, and is dated at about 73 years after Muhammad's death. The Sana'a Quran has many erasures and alterations on its pages. It also has only 43 Surahs (chapters), in contrast to today's standard Quran, which has 114 chapters. Why is the time line important? 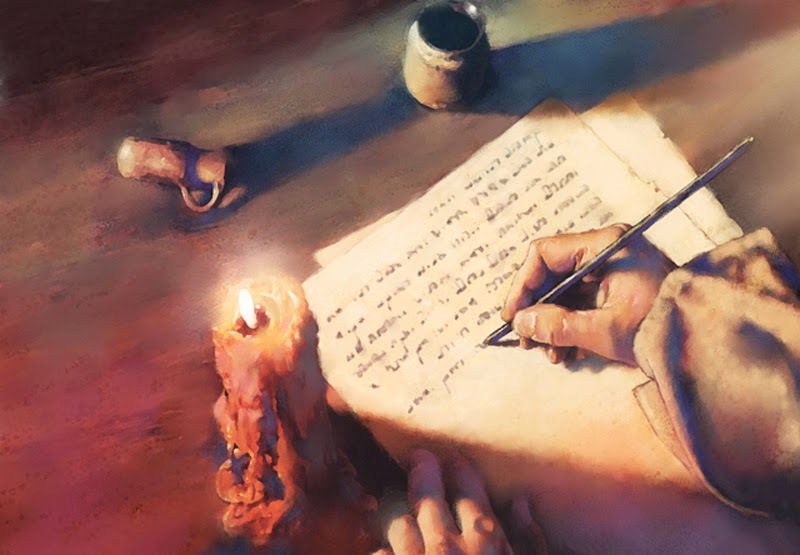 It is important because the facts which were related in the Gospels could have been confirmed or denied by the apostles and disciples of Jesus, many of whom were still alive in 70AD. The Apostle John, for example, was said to have lived beyond 100AD. Had there been any corruption of the Bible text, any of these men and women would have spoken out against it. The first reference to an Arab "Scripture"
There are no extant Quranic manuscripts until the 8th century, which clearly shows that Muhammad had nothing to do with the Quran that Muslims have today. The problem this poses for Muslims is the fact that they believe that Muhammad was the Final Prophet. As such, anything that was written after his passing cannot be reliably attributed to him. Neither was the Quran that is in Muslim hands today ever vetted by him. He never saw what form it took, neither did he get to see what was put into it, or what was left out of it. Muhammad himself never called for the Quran to be put down in writing, and this means that his followers took a path "Allah" never commanded for them to take when they did so. This may be one of the reasons why there are at least 50 different versions of the Quran, according to Islamic scholars. 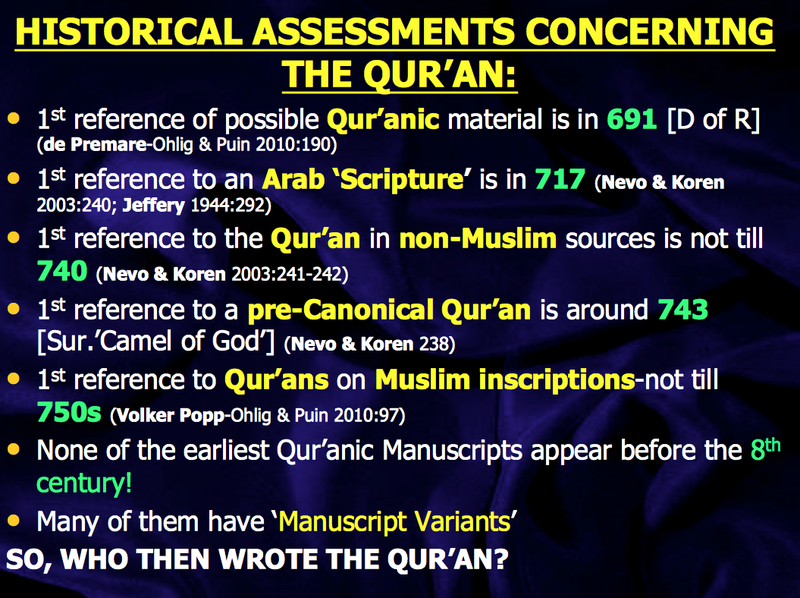 Note that these are 50 different versions of the Quran, not just translations. Historians and scholars would have wanted to see "the original" Quranic manuscripts, but Uthman had them all burned after they had been sifted through and parts of them edited. The Islamic sources record that they were burned precisely to avoid any future textual issues. In sum, Muslims find themselves following a Quran with an extremely tenuous and apparently manufactured history. Even worse, Islamic sources say much of the Quran has been lost, while other parts were simply forgotten. In contrast, the entire New Testament has been in the hands of Christians (and even many non-Christians) for almost 2,000 years now with not one epistle or Gospel lost. Even today, Bible manuscripts are being discovered that had been previously hidden away for centuries, and yet, amazingly, experts have yet to find a single one that departs from the text we already have in our hands. This shows us that Christians can depend on a Holy Spirit-inspired text from its writing to its preservation which has remained untainted and uncorrupted from the beginning. With many thanks to my brothers Anthony Rogers, Samuel Green and my fellow E-MAMS for allowing me to pick their brains. 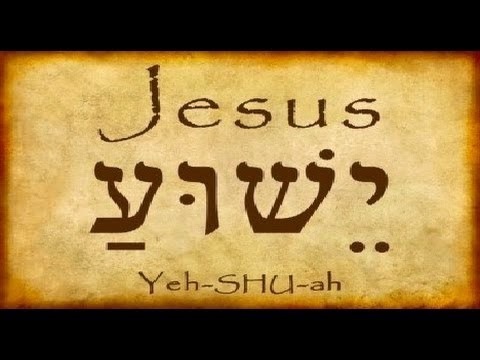 Jay Smith vs. Dr.Shabir Ally - Bible vs Quran: Which is the Word of God? Are the chains of narration (isnad) for the Qur'an reliable?